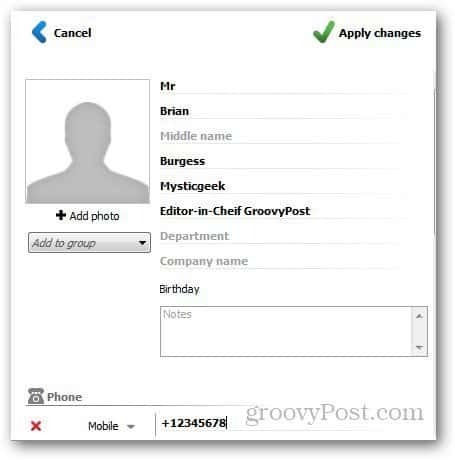 CopyTrans Contacts is a very useful application that allows you to manage your iPhone contacts. Here’s a look at how easy it is to use. 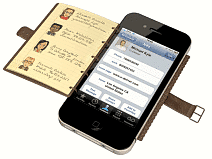 Managing contacts on smartphones these days can be a time consuming task and somewhat annoying. The major problem arises when you have to transfer your contacts from one device to another. Take the iPhone for example — you can back up your contacts through iTunes, but that is a tedious process as well. If you use an iPhone and want to manage your contacts in the easiest way possible, give CopyTrans Contacts a try. CopyTrans Contacts is a very useful application that allows you to manage your iPhone contacts. You can edit your contacts, import/export them, and transfer them to other devices (iOS and Android), iCloud, Gmail and many other services. You can even import contacts from other online services to your iPhone. 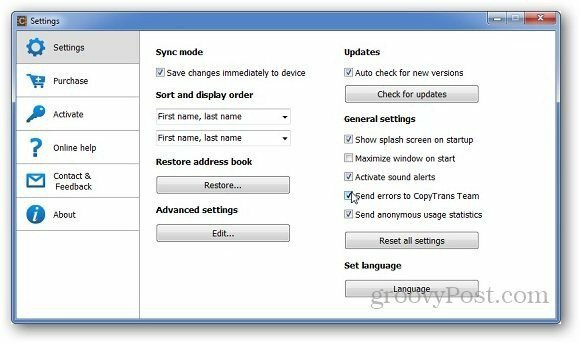 Just download CopyTrans Contacts and extract the contents of the zip file. 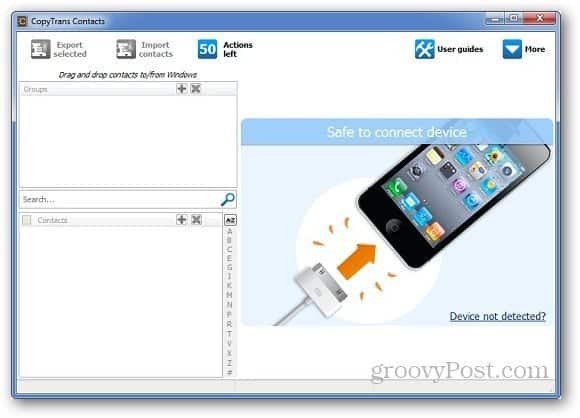 Connect your iPhone to your PC and launch the program. The best thing about it is that you can run it from a portable flash drive and run it without installing. After connecting your device, it will show you all of the contacts on your iPhone. 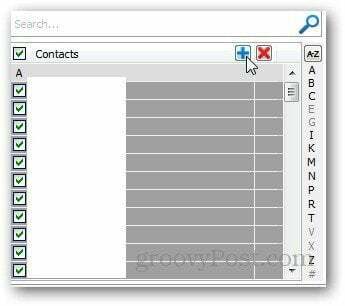 You can add new contacts, edit them or delete them. Just click on the “+” button and it will open the New Contact Page. All you have to do is add the details and click on Apply Changes and it saves to your phone. You can change the way the contacts are displayed from CopyTrans settings. 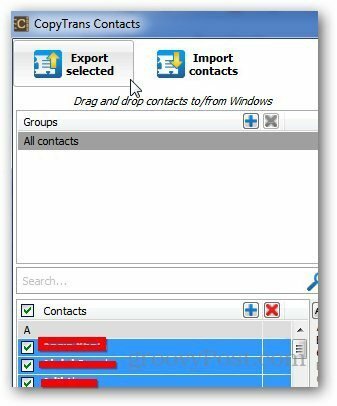 To back up your iPhone contacts, click on the Export Contacts button. 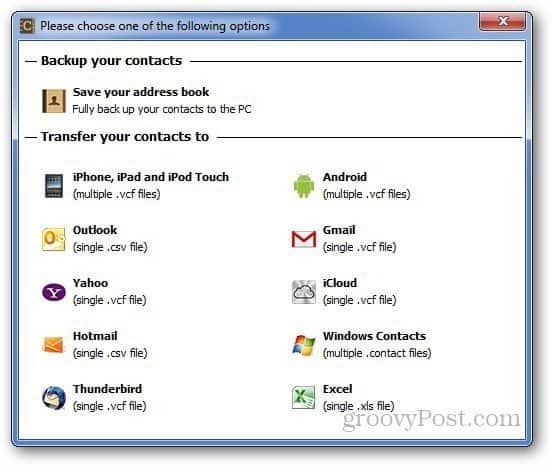 It will open a new window which will show you different options to back up your contacts. You can either save them on your PC or transfer your contacts to other devices and online services. Select the option you want and it will save them in a jiffy. Similarly, to restore the contacts, just click on Import Contacts button and browse the location of the backup files. 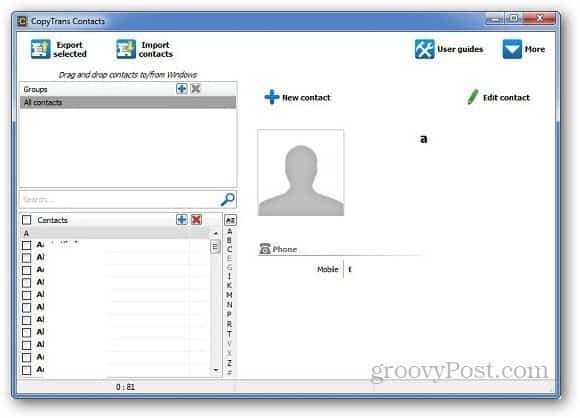 The software supports csv, vcf and contact file types which can be used to restore the contacts. CopyTrans Contacts is one of the best applications I have used so far to manage iPhone contacts. It cannot get any simpler than this. Do note that the trial version offers you to use it for 50 actions after which you must buy the license for $9.99 after that. If you’ve ever ran into the headache of transfering contacts between devices, I think its worth the price because it makes the process so easy. If you switched from Blackberry to an iPhone, check out how to transfer contacts from your Blackberry to iPhone.